This month has seen the highest number of records submitted to the ARDB ever! A staggering 24,702 new records were added! Andre Botha has submitted Ronelle Visagie’s data which totals 6,821 records for the Karoo and Northern Cape. Munir Virani has submitted Adam Eichenwald’s (an intern working with The Peregrine Fund) 588 records for Kenya. 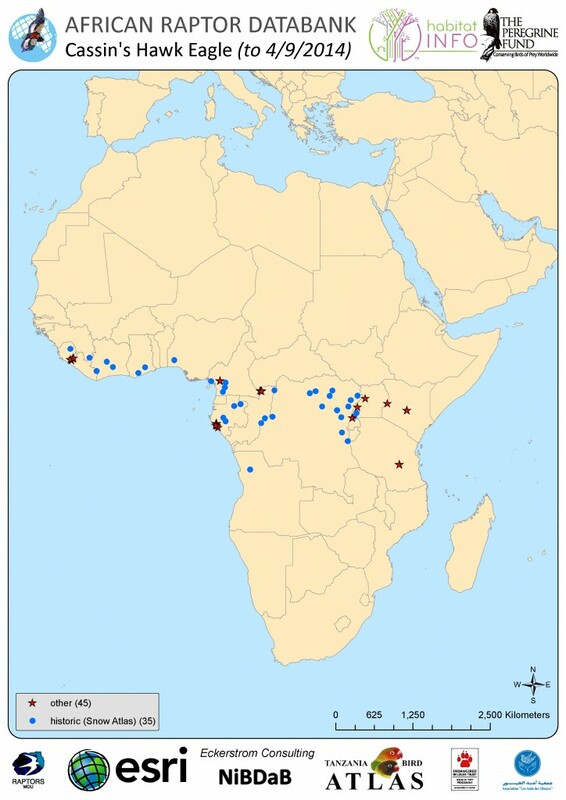 We’ve also received data from Martin Odino (183, Kenya) and Ralp Buij (7 records of Cassin’s Hawk Eagles from Gabon and a huge 9,228 from Cameroon). The Tanzanian Bird Atlas have also submitted to the ARDB an additional 8,163 records which includes the first major delivery of owl data (on top of the 11,793 records which were already in the ARDB from them)! We’ve still got some great data received during August to report on next month after receiving Bateleur records from Rick Watson which we are waiting to digitise the routes for. Darcy Ogada and the ARDB are trying to get all the existing Cassin’s Hawk Eagle records into the ARDB for a small project we are working on. We’d appreciate your help in adding any additional records you may have or know of that are not already on the map – we’ve had a great response so far taking the number of records from 25 to 45; see the map below (the blue dots are from the Snow Atlas and red stars are other records).